Homemade Hainanese Chicken Rice served with silky smooth poached chicken, thinly sliced cucumber, and garlic chili sauce. It is so simple yet so delicious. 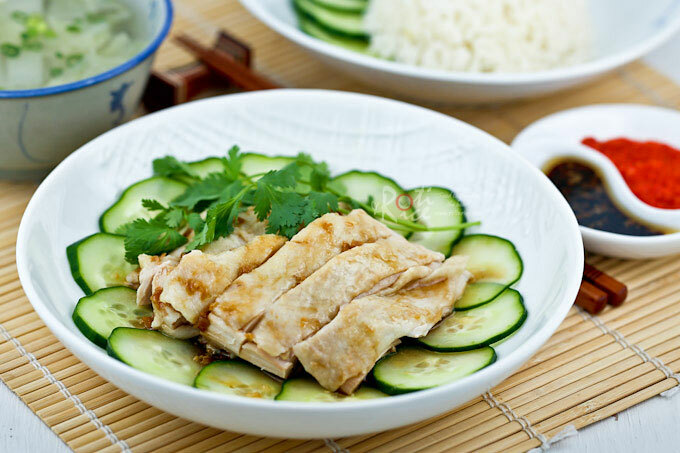 Hainanese Chicken Rice is a perennial favorite in Malaysia. This simple yet tasty dish is enjoyed by locals as well as visitors and is a mainstay at the food courts. The wonderful flavor of the rice and chicken combine really well with the garlic chili sauce. Achieving a silky smooth texture of the chicken is an important part of its preparation and this can be tricky. If the chicken is over cooked, it will be dry and tough. Under cooking it may leave the chicken a little too “pink” at the joints, which may not be safe for consumption. To get it just right calls for a short and gentle simmer on the stove followed by a long poaching of the chicken in the boiling water with the heat turned off. The chicken is then shocked in a cold water bath for a few minutes to stop the cooking. The timing is all important. It has been a while since I last tasted Hainanese Chicken Rice. During my recent visit to England, my dear friend DongXing and I decided to prepare this tasty dish using her mom’s recipe for the chicken. We used chicken thighs and drumsticks instead of a whole chicken. Because of that, the steeping time had to be reduced by half. Originally, the rice is cooked using chicken fat and broth but my mom came up with the idea of using butter instead. This allowed us to reserved the chicken steeping broth for soup. It worked out really well. We were able to cook the rice while the chicken hung out in its hot and steamy bath. The results were no less stellar! The thighs and drums were perfectly cooked – silky smooth and not pink at all! I have since cooked this twice at home and the family totally enjoyed it. I would like to add that the simmering and steeping times was just right for this time of the year with the home ambient temperature in the mid 70’s F (mid 20’s C). Changes will likely be needed in the winter when the average temperature in the house drops to the mid and upper 60’s Fahrenheit (upper 10’s Celcius). Ahh…the trials of cooking in temperate climate! Hopefully I will be able to test out my theory and add a note to the recipe in the winter. Melt butter in pot. Sauté garlic and ginger for 1 to 2 minutes. Add rice and fry for 2 to 3 minutes. Add 2½ cups (600ml) water and salt to pot and bring it to a boil. Reduce heat to medium and allow it to simmer until all water is absorbed, about 10 minutes. Turn heat down to the lowest setting and leave pot on for another 5 minutes. Turn off heat, remove pot. Allow cooked rice to sit for 10 minutes before serving. Alternatively, transfer rice to rice cooker. Add water and salt and press the cook button. Blend all garlic chili sauce ingredients until fine. Remove and divide into 4 small dishes. Drizzle a little soy sauce and a few drops of sesame oil onto the chili sauce. Store the remaining chili sauce in a glass jar. Place garlic and sesame oil in a small microwaveable dish and microwave on high for 1½ minutes. Remove and mix in 2 tablespoon soy sauce. Set aside for now. Line a dinner plate with sliced cucumbers. When chicken is ready, remove and immediately submerge it in a cold bath for 2 to 3 minutes. Reserve the chicken broth for soup. Remove bones from chicken leg quarters and cut into bite size pieces. Place onto sliced cucumbers. Drizzle the prepared sesame garlic sauce over chicken. Skim off fat from reserved chicken broth. Discard ginger. Bring it back up to a boil. Season with salt and pepper. Add Napa cabbage and allow it cook for 2 to 3 minutes. Turn off heat. Ladle into 4 serving bowls. To serve, divide rice onto 4 plates. Dish a portion of chicken onto each plate. Serve immediately with garlic chili sauce and a bowl of soup for each place setting. ** Simmering and steeping time is right for home ambient temperature in the mid 70’s F (mid 20’s C). Changes will likely be needed in the winter when the temperature drops to the mid and upper 60’s F (upper 10’s C). NOTE: This post was updated on September 18th, 2014 with new pictures. « Fusilli Chicken Sausage Salad and Giveaway! Biren, I am so happy you posted this. I have always wanted to try Hainanese chiken rice, but since I am not where I can get it made for me…looks like I have to try making it myself to get a chance to try it. Your photos are so helpful, and your explanation as well. It is still quite hot and humid here in Florida…usually through October. I just love how different cultures create so many unique dishes with the same simple ingredients such as chicken and rice. I can totally see myself making this and loving all those great flavors in the chicken, rice, and sauce. The soup made with the broth and cabbage sounds great too. Great post again! Thanks Hyosun! It is really interesting as many of the dishes have similarities like the Chinese chap chai and the Korean japchae. I will be posting that soon. So glad to hear you like the flavors of this dish. I hope you will give it a try. You will not be disappointed. Biren, I love this post. Your chicken sounds wonderful. In fact, it even sounds cool: it hangs out in a hot and steamy bath while you can get on with the other steps. Great short-cuts, too. Oh, and did I say it all looks absolutely delicious? One of my favorite dishes – love the dipping sauces. Biren, I am coming over for lunch 🙂 This is my fav and I can eat this everyday. I am so glad we got a chance to cook this together. My husband was so turned off from this dish ever since I cooked a whole bird like this which turned out still pink on the inside – I lost my nerve about cooking it again. It was an excellent idea of yours to use chicken quarters. Now this dish has been requested again, complete with the dipping sauce and most importantly, the cucumbers at the bottom of the chicken. Thank you! I think many people are put off cooking this dish as it can be tricky getting it just right. I don’t blame you for being jittery about cooking it again. I may have attempted it once and never did it again for the same reason. Glad we were able to overcome that. So good to hear your family has requested for it again. My family enjoys it very much too. Yes, the cucumber is a must. It is so tasty after absorbing that sesame garlic sauce. Thank you for sharing this recipe! I love Hainanese dish. I’ll be visiting Singapore next weekend and I’d like to try this to surprise my friend. First of all, I have the same dishware…;)!! And what a coincidence! I just made Hainanese chicken too two days ago, I didn’t make the rice though, maybe I should make a small portion so that it feels more authentic ;). Your chicken rice looks extremely yummy! Oooooh! My childhood dish!!! I love that you also shared the chili sauce with us. I used to dump loads of that on my rice! Someone literally just asked me where I wanted to travel to next and I said Singapore and Malaysia. I must have been channeling this dish! I’ve never had or heard of this dish before but it sounds delicious! I love chili sauce with almost everything. This looks like a wonderful meal and what fun to have someone to cook with! I love Hainanese Chicken Rice and other southeast asian dishes too! Greetings from the Netherlands! This sounds delicious; anything with fresh garlic and ginger are sure to steal my heart! 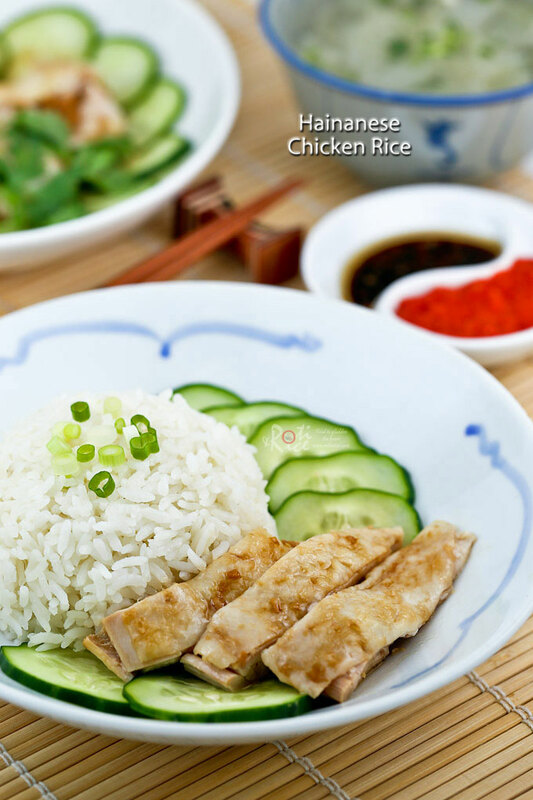 I love Hainanese Chicken Rice and yours definitely looks delicious! Ive never seen the rice cooked with butter and sauteed garlic and Ginger before. That sounds like a wonderful idea, I’ll have to try it next time. Thanks for your recipe to this lovely dish, Biren. This sounds great! That chili dipping sauce sounds right up my alley! Biren, thank you for posting this. I have always wanted to make chicken rice at home. Now I can! Oh I just had this last week and was wanting to know how they make this! Bookmarking this for later! I’ve seen this dish in Asia but haven’t got the change to eat it as there are so many great dishes out there. It sounds wonderful and easy enough to make it even on a busy work day. I thought that the rice was boiled in the chicken stock, or at least I think I read that somewhere. Anyway have a great weekend! 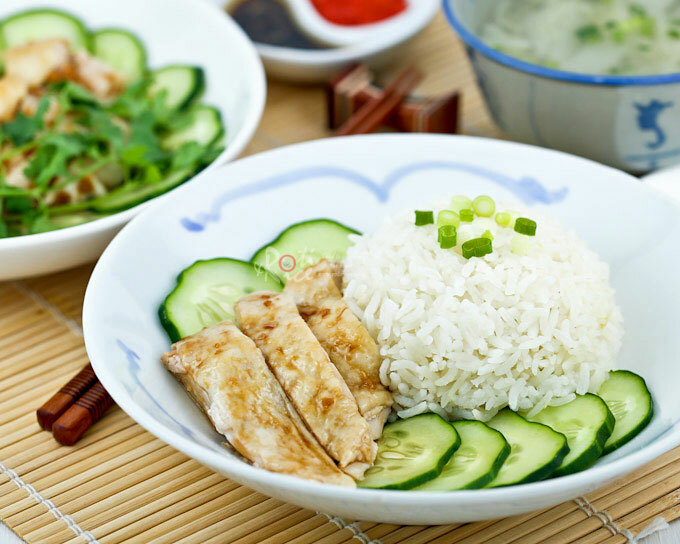 Wow…instant Hainanese chicken rice! There really are all kinds of pre-packaged food out there. I’ll be interested to know what you thought of it once you’ve tried it. I will never tire of this dish. One of the best comfort food. The way you made it really looks like the chicken rice in Malaysia. I am craving for it now, Biren. Great blog Biren! My husband always talks about this dish! Thanks for the recipe will definately ty it!